Sustainable Solano offers practical ways of applying permaculture principles in your garden and community through its monthly “Walk the Talk” series, which takes place the last Saturday of the month at the shelter at 310 Beck Ave. Topics vary from sustainable landscaping to wise water use, soil building and other aspects of permaculture. These talks are free and open to the community, but registration is required. Swales save thousands of gallons of water from being wasted and puts it all into use, he said. Sustainable landscaper Jeffrey Barton talked Saturday about permaculture on a community scale and the impact of its principles on people, health and habitat. The presentation illustrated how massive amounts of free food are being grown by community members on both private and public land, nourishing the surrounding community and serving as an educational lab for people interested in creating resiliency and living more sustainably. The small gathering Saturday heard about food forest gardens, which can be fed by secondary water (a laundry-to-landscape greywater system or diverted roof water). “We can create community spaces with food forests,” Barton said. 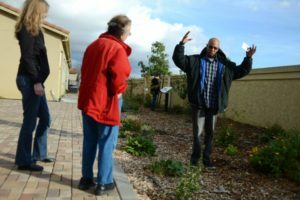 The former Mission Solano put in a food forest garden in December with a 1,300-square-foot space filled with fruiting trees and edible plants, something Barton helped see to fruition.